Recognising the confusion of her Mama’s unshakable beliefs, Madilla searches for her own truth. What she learns is that the magic she feels through her piano is only the beginning. I was approached by the author of this book, who gave me a paperback in exchange for a review. I devour this book in 2 readings…The writing was beautiful and the way author build this world it was so easy to get lost in it…Though I didn’t like the world. Where men treat women so badly and Ram soldiers treat them cruelly. The first half of the book is so original, everything was there in balance, the family, friends, hardship of life, beliefs, tradition but nothing was overwhelming. The second half of the book didn’t impress me that much, I found MC too irritating and annoying, I wish if she could just hold her tongue. Magic in this book is so different from the other books I’ve read, but that wasn’t for me. 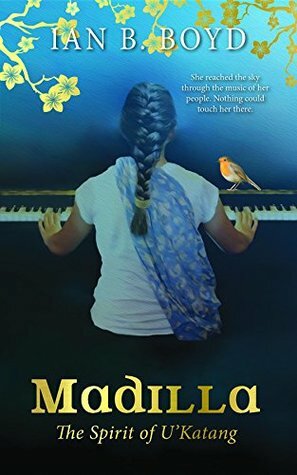 I love Madilla’s relationship with piano, her escape from the real world, is defined beautifully. What is wrong with a goat? why everyone keeps calling each other silly goat or old goat? Thanks to Fizah from Bookstalesbyme fro reviewing Madilla: The Spirit of U”Katang. And thanks for being so patient in waiting for her to arrive in the mail. I love books that you devour in 2 sittings, its the best feeling to be that engrossed in a story. Love reading your good honest review. This book sounds interesting. Shame the second half wasn’t as good as the first half. This sounds like an interesting read. Thanks for the honest review! Great review! A shame you didn’t like the world the story was set in all that much and that the second half wasn’t as strong. I love books from perspectives outside of the mainstream. This sounds really interesting. Looks so cute, great review. Thank you… I haven’t read that one. It seems like an interesting read. Too bad the 2nd half wasn’t as good as the first.